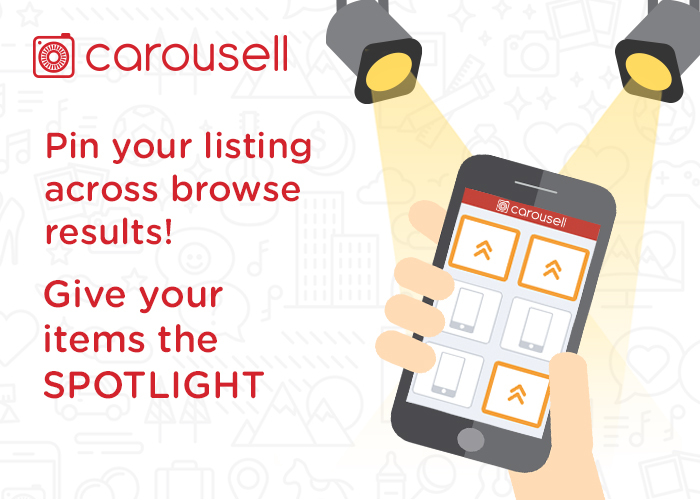 Carousell Listing Insights is a tool to check your listing’s performance on Carousell. 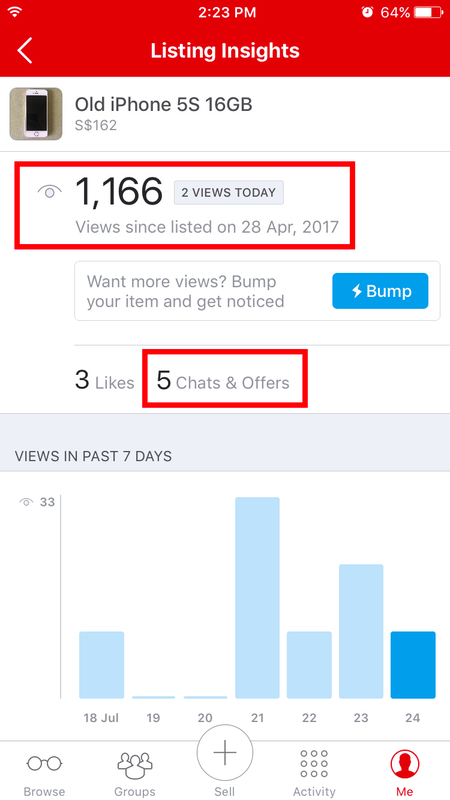 You can track how many views, likes, chats and offers you receive for your listings. 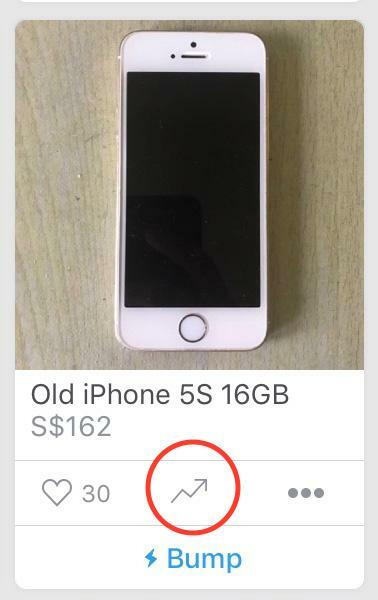 Before Listing Insights was released, Carousell users had questions like: Did anyone view the items I’m selling? How do I find out if other Carousellers like what I’m selling? After all, you want to successfully sell away your items. Previously, you can’t tell the reason behind why nobody’s buying your item. It’s frustrating. But, it’s different now with Listing Insights. We released Listing Insights so you can be in better control of your listings. We want you to know how many views, chats and offers you get. And, we want you to have a quick and easy way to find out. Let’s start with how you can check your Listing Insights. First, you can head over to your profile on Carousell. Next, scroll through your unsold items and choose the one you want to check. Listing Insights only works for active listings. You’ll land on a page called the Listing Insights page. I took a screenshot below to show you how simple it is to check how your item performs. The Listing Insights page shows you everything you want to know about your item. You can see how many views, chats and offers you get. It even tells you how many likes you receive (you might be Mr. or Mrs. popular on Instagram or Facebook, but don’t expect the same number of likes). Next, I’ll teach how you can interpret these numbers to increase your chances to sell. Now you see a bunch of numbers on your Listing Insights page, but you’re wondering what you should do next. Let’s look back at it again. If Listing Insights shows that your item gets more views than chats and offers, work on changing your item description. You could reconsider the price of your item too. But, if Listing Insights shows that the views your item get are low, change your title and replace your photo with a better one. So, how do you improve on what you found out with Listing Insights? I’ll share four tactics you can use to help you sell faster. 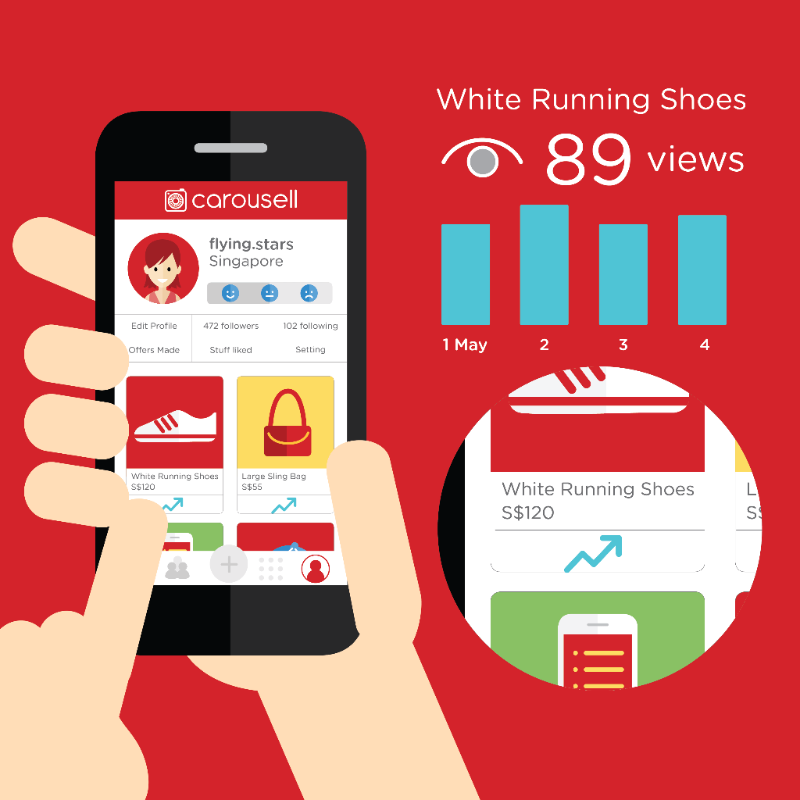 Carousell has a feature that helps you quickly increase the views your item gets. It’s called Carousell Bumps. Before you start getting over-excited, check your Listing Insights for the item you want to sell first. If your views are low, you can consider getting a Carousell Bump. If you’re not convinced that a Bump helps you sell faster, read this next sentence twice. 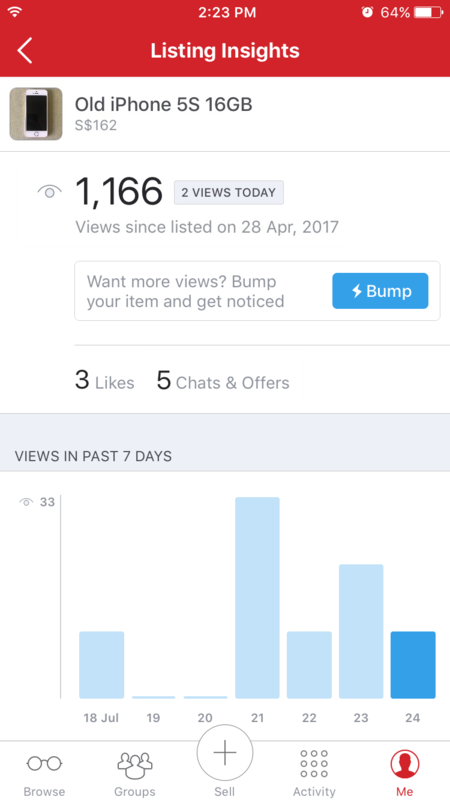 A Bump gives you a 230% increase in views for your listings! Amazing huh? A Bump is super useful to help you sell your item faster. Check out this article that shows you how it works here. Taking great photos can mean the difference in getting more views, especially in a marketplace with millions of listings competing for attention. You should replace your picture if your views are low. People are attracted to catchy titles. I’m sure you’ve been to a bookstore at least once in your lifetime. Remember how you selected a book over the other just because the title sounds way more attractive and catchy? It’s the same for buyers on Carousell. Change your title to something catchy if you want them to stop scrolling and tap on your listing. It helps to be specific about your item. How does one buyer choose between two iPhone 7 with the same price on Carousell? They compare their description. It’s all in the story. If you have a great story behind the item you’re selling, buyers will be more attracted to consider yours over many others. Like writing titles, you should be specific about your item within the description. Telling them why you’re selling it helps too. 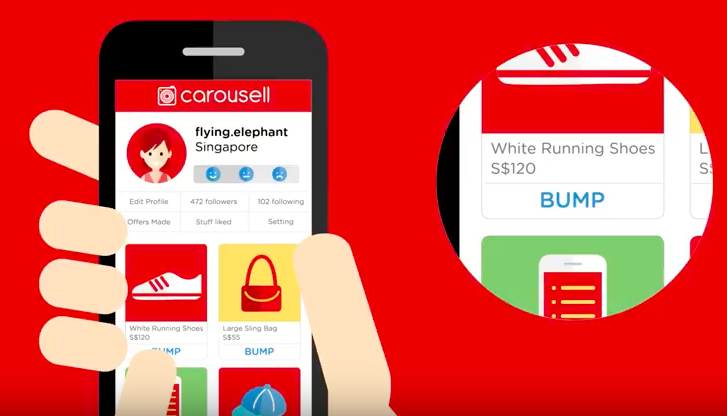 I hope this guide helped you understand how Listing Insights can empower you to be a better seller on Carousell. Knowing where you can improve makes all the difference. Now, you can expect faster sales with the tips that you’ve learnt! Feel free to leave me comments if you have any other questions! Happy Carouselling! Share this article with your friends on Carousell too to help them become expert sellers like you! Glad you love it! Thanks for being a part of the community! Got a quick question that’s been bugging me ever since I started listings in Carousell. Why do we sellers ONLY get 4 photos to upload to our listings? Can’t it be more?….. 10 frames at most…..
Or edited vid of not more than 10 secs. Just a suggestion…. So we sellers can beautify all items they are selling. Hey Fyruz! That’s a great suggestion that we can definitely consider. We’re working on exciting new things that will benefit you and the rest of the community so stay tuned.